One function of computers is to allow us all to boot up and hold our vision at once to heal ourselves, others, and the living earth. This is the first time in history anyone can share an image, prayer, and vision of healing with intent, with others without extensive spiritual training. We will start this process on this site by a simple beginning, and if people like it, we will take it much further. To join us in this collective healing vision, start by making a book mark to this page, the Alex Grey Theologue page, in the medicine wheel web, and boot up with its image when you start your day or at anytime you wish to heal with intent. Then do a guided imagery with the brief imagery exercise below and/or meditate on a point of light, like an intersection in the painting. Then let this image flow around the earth and see yourself as one node with your art and prayers as your emanation. Put yourself in the web of lines and light and hold your vision of yourself as a healing artist with your vision that you are working on, in place. See all the others around you as far as they go, forever, back and forwards in time and space. Feel yourself heal, feel us heal, feel the earth heal. Come out slowly, move your body, touch the ground, pray or meditate on peace, and go on with your day. An imagery to make yourself a node of light in the healing web surrounding the earth. Blessings to you, welcome to the spirits of healing, the four directions, the animal spirits, the ancient one. Call them in to you as you breathe and as you look to each side of your in a prayer. Now make yourself comfortable, take some deep breaths and let your abdomen rise and fall, go to your place of imagery or meditation, go to your place of peace and power. Now imagine a noosphere as a web of light that surrounds the earth. It looks like lines of light or pure energy crossing and meeting at nodes that light up and explode with love. Now imagine that you are one intersection, one node of exploding light and love. For each of us as a healing artist is only alive as the node that lights up and holds one point in the web in perfect peace. As you glimpse yourself as a healing artists and hold your healing vision you help make the web and she is born. Go deeper now. Drop into your center, if you have ancient spirits or power animals call them to you. Know that you are a healing artist who has a vision to heal yourself, others, and the earth. Feel deeply that as you hold this vision or even hold your space with intent your node is lit up and radiates love and you make the web that heals the earth at this moment. Look at the Alex Grey painting Theologue, and see the nodes of light and the intersecting lines. See them as surrounding the living earth with you as one intersection. Hold your image or poem or song or healing prayer and make it your point of light. See the web as whole and you are seen and she is born again. We want to make this imagery a daily reality. We want to form the medicine wheel web to create the nodes of light around the earth to heal. To become a node on the medicine wheel web send us an image in a slide, photo, or any other writing, songs, dance, etc to the contact page. or regular mail l to: Art As A Healing Force, 710 Horseshoe Hill Road, Bolinas, Ca. 94924. I will post your imagery and words as a healing artist on the medicine wheel web as your node. 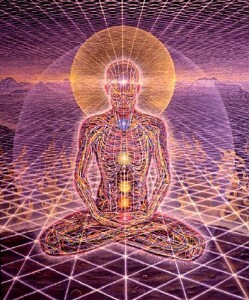 Each day you can hold your healing image or pray or meditate on your place in the web as in Alex Grey�s lines meeting.